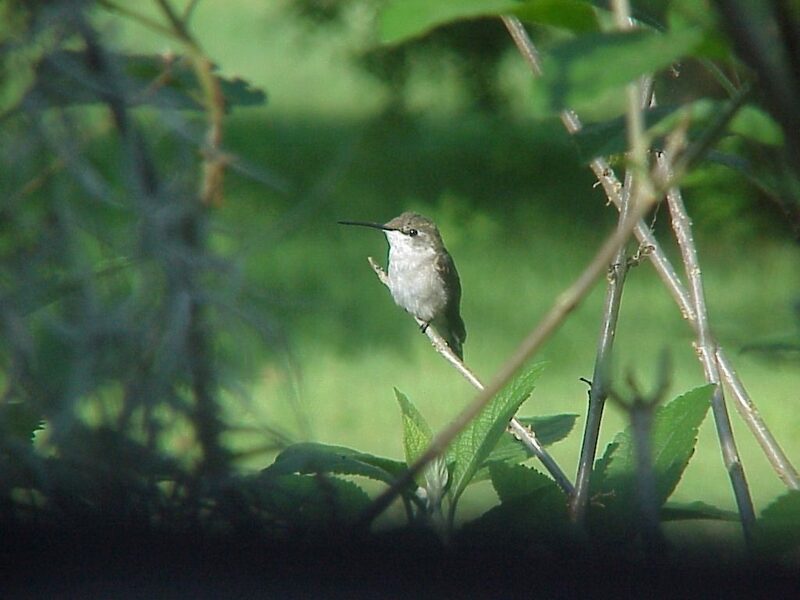 Ruby-throated hummingbirds (Archilochus colubris) are a familiar site, and sound, in my backyard. My garden chores are always lightened by having the little, glittery green, squeaking & twittering, hummingbirds zooming around after each other. The majority of their diet consists of nectar, but they also consume insects and sap when they are available. Their northward migration doesn’t exactly coincide with the blooming time of many flowers so hummingbirds drink tree sap that is dripping from holes that sapsuckers have drilled. 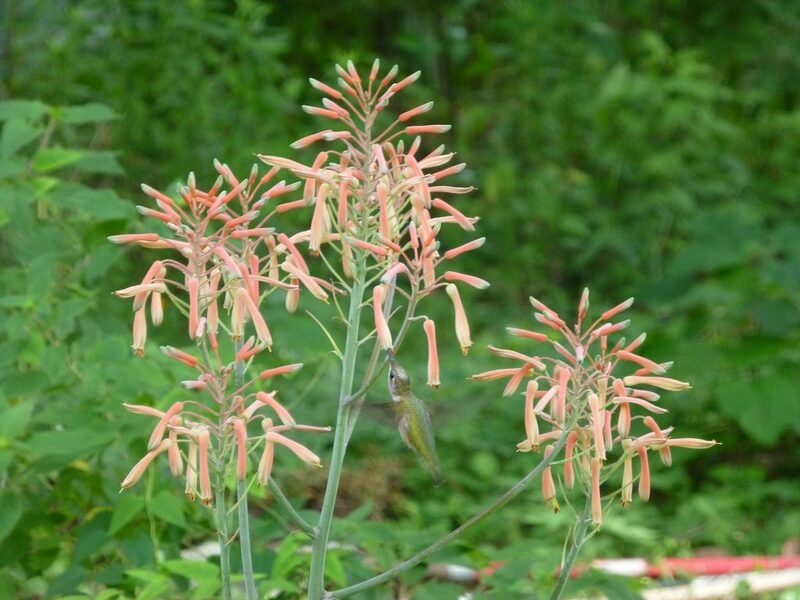 A carefully planned garden can provide hummingbirds with a nectar source throughout the year. Remember to plant a variety of flowers that bloom at different times of the year. One male hummingbird requires the amount of nectar in 1,000 blossoms every day to maintain its body weight. Please don’t make your hummingbirds ill by using pesticides! The insects in a hummingbird’s diet consist of such things as gnats, winged ants, fruit flies, small beetles, weevils, aphids, moths, mosquitoes, leafhoppers and spiders. Most of these are caught on the wing, but some are ingested inadvertently while drinking nectar, or sap. A supplementary food source of sugar water can be supplied. However, great care should be taken to keep a supply of fresh sugar water in the feeders at all times. In the Florida heat, and humidity, the sugar water must be changed at least every three days to avoid spoilage. Clean the feeders with hot water and vinegar, and rinse thoroughly. Do not use honey, instead of sugar, as it may produce a fungal disease in the nectar. Do not place feeders or flower beds too close to windows. Hummingbirds can travel up to 30 miles per hour and an impact with a window is usually fatal. Hummingbirds tend to become very territorial over ‘their’ flower patch or feeder and will want to rule over it with an iron claw. By providing perches you can give them a throne to rule from. Next time you are going to trim off the tip of a branch that has tiny dead twigs on it – leave it for the hummingbirds to perch on. Hummingbirds always pick the littlest branch of all. You will be rewarded with an opportunity to watch them preen, clean their beaks, and posture towards intruders. They will chase anything that comes into their area including butterflies, bees and other species of birds. They really are very big for their little, tiny, britches. The male ruby-throated hummingbird prefers woodland edges, orchards, thickets, and hedgerows. Mated females prefer woodland streams and riparian areas. If the food source that you provide for them is abundant (remember that feeders are only supplemental) and the habitat is right you may be lucky enough to have them nest on your property. Hummingbird courtship occurs immediately after spring migration in April and May. The male displays for the female by flying a pendulum-arc. The male makes a loud buzzing or humming sound following the path of a narrow arch in front of the female. They do not pair for any length of time. After copulation the female goes off to build the nest and raise the young by herself. 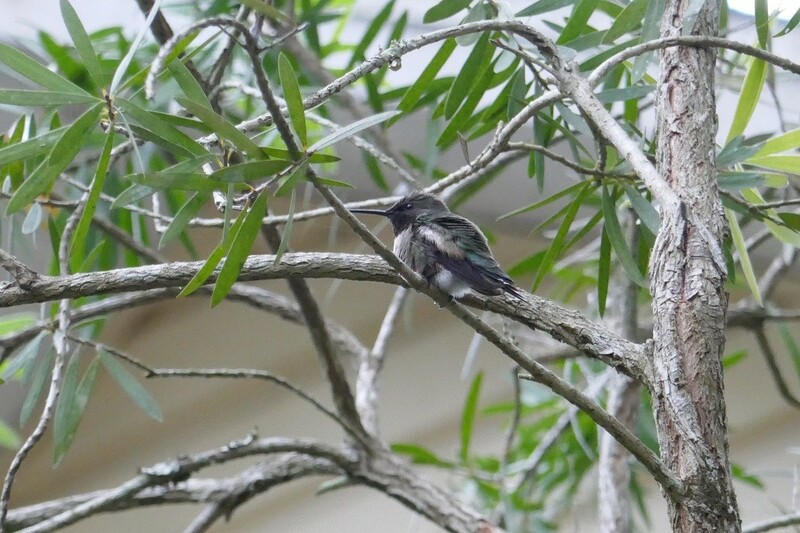 A hummingbird nest is so well camouflaged that many times it is overlooked because it resembles a knot on a tree limb. The female generally chooses a limb protected by overhead foliage and overhanging a brook. She starts with bud scales attached to the limb with spider silk. She then adds lichens on the outside and plant down on the inside. She shapes the nest with her body as she adds material. The inside diameter is no larger than a penny. The pair of tiny eggs are not laid at the same time, and an interval of a day may pass between each egg. Incubation begins after the last egg is laid, and takes up 60 to 80% of her time. The eggs hatch after about 16 days. The pea sized hatchlings have just a few downy feathers, are dark gray and have short yellow bills. They are fed a mixture of insects and nectar that is regurgitated by the mother one to three times an hour. The nestling phase can last anywhere form 14 to 31 days depending upon the weather and the abundance of food. A few days before they are ready to leave the nest they begin to exercise their wings. They anchor themselves to the edge of the nest and vibrate their wings rapidly. They generally stay in the vicinity of the nest for several days. The young explore flowers on their own, but are still fed by the mother for up to 34 days.